A “Tax Justice Now” leaflet produced by Independent (former Labour) MEP Nessa Childers. The leaflet proposes the introduction of the following.. 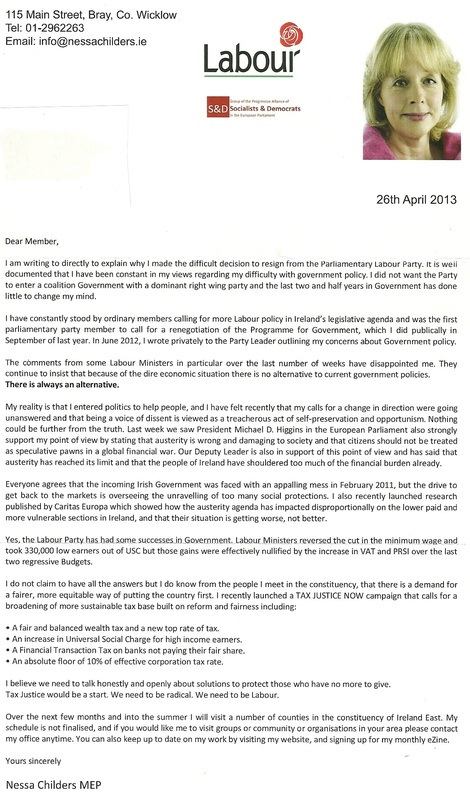 Dated 26th April 2013 a letter from Labour Party Ireland East MEP, Nessa Childers to Labour Party Members about her resignation from the Parliamentary Party. The letter outlines the various reasons why she did so. From the 2009 European Elections a leaflet from Libertas candidate Raymond O’Malley who was running in Ireland East. O’Malley polled 18,557 votes and failed to win a seat. From the 2004 European Elections a leaflet for Independent candidate, the Wexford-based actor Joe Neal. Joe Neal was ‘formerly an active member of the Green Party’. He polled 1,487 votes. 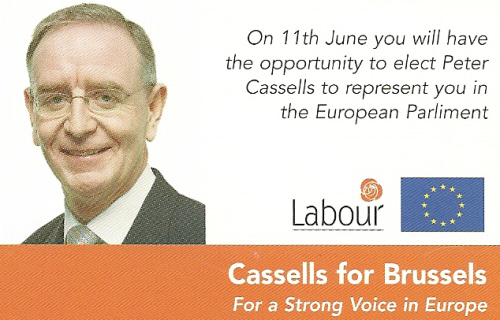 From the 2004 European Elections, a Canvass card with a Quiz on the back (which someone has tried to answer) from Peter Cassells The Labour Party candidate in Ireland East. The answer to Question c is fairly vague. Peter Cassells is a former head of the ICTU. He polled 59,158 votes (13.05%) and failed to win a seat. 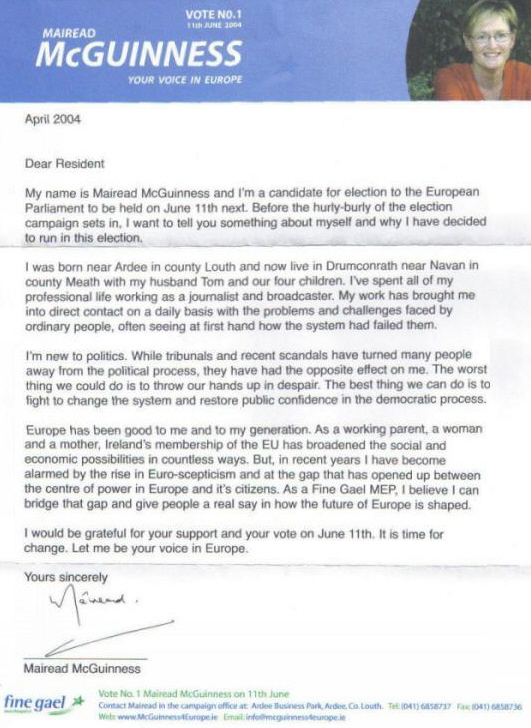 It was quite a coup when Fine Gael secured Journalist and TV presenter, Mairead McGuinness on its ‘East’ ticket for the 2004 European Elections. A hard-fought campaign and rivalry between herself and Avril Doyle led to Fine Gael winning two of the three seats on offer. McGuinness topping the poll with just over a quota. Taken from the 2004 Euro Election campaign. Pro-Lifer and (former?) Youth Defence man Justin Barrett adds Immigration to his policy bow. “Demanding Irish People are given priority to all new jobs” and all sorts of other nuggets.